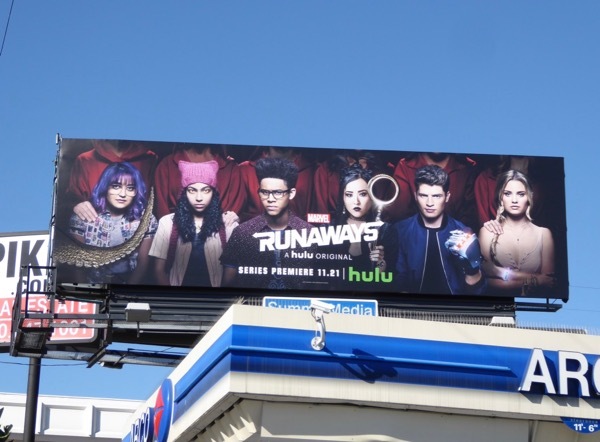 Another day and another gaggle of Marvel comic book characters make their leap from the printed page to the small screen in time for Thanksgiving with Runaways. 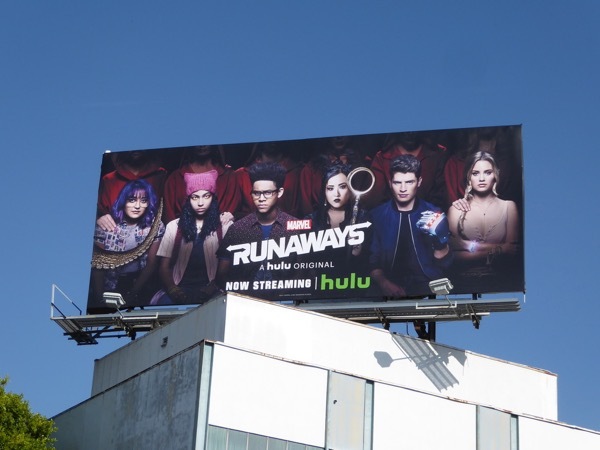 This time the series isn't on Netflix of ABC, but on streaming platform Hulu, which isn't too much of a surprise as Disney (Marvel's owner since 2009) holds a 30% stake in the service. 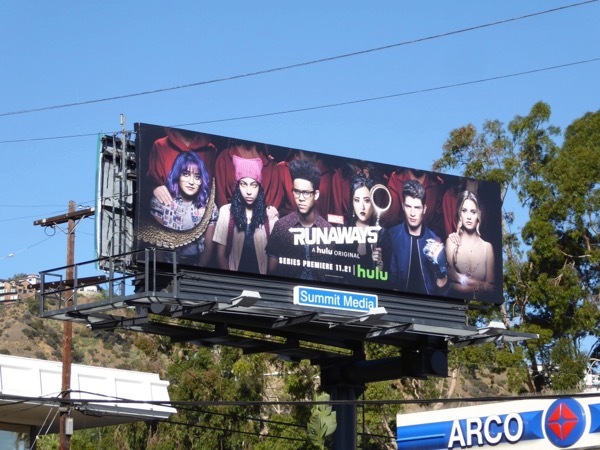 This group of Runaways made their debut in Marvel's Tsunami imprint in July 2003 and were created by writer Brian K. Vaughan and artist Adrian Alphona. 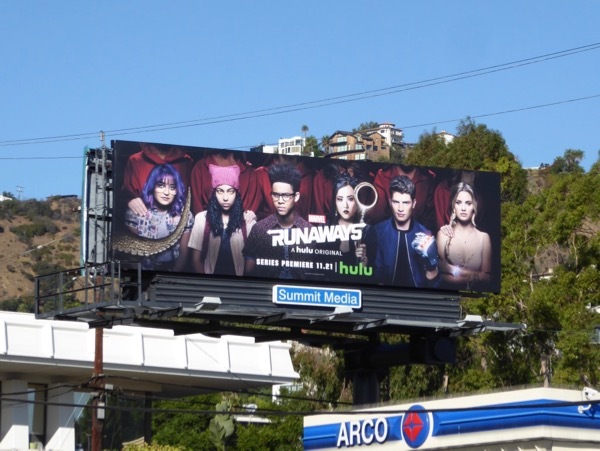 'Gertrude "Gert" Yorkes', 'Molly Hayes', 'Alex Wilder', 'Nico Minoru', 'Chase Stein' and 'Karolina Dean' were a bunch of ordinary teens who one night learnt their parents weren't just friends but were 'The Pride', a crime syndicate made up of mob bosses, dark wizards, telepathic mutants, aliens, mad scientists and time-travelers. After seeing their parents making a human sacrifice in a weird ceremony the kids steal weapons and resources from their folks and go on the run together. 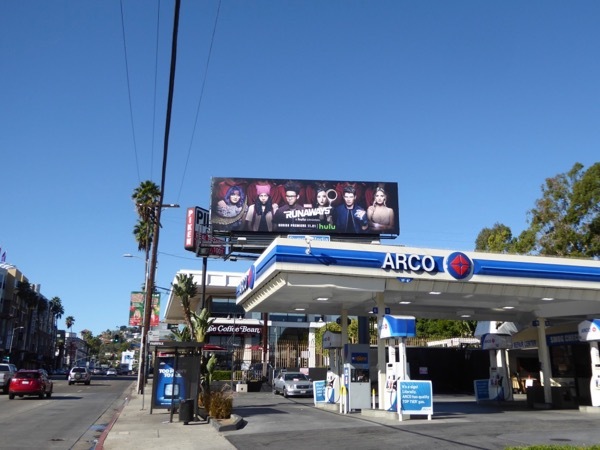 This marvelous series premiere billboard was snapped along Sunset Boulevard at Fairfax Avenue on November 18, 2017. 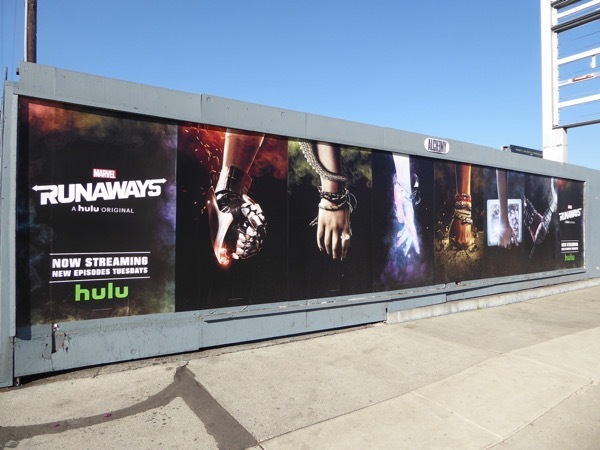 Marvel aficionados can also check out all these cool billboards for their TV and movie adaptations. The ten-episode first season will debut on November 21, 2017 with three episodes for you to binge, followed by weekly installments. 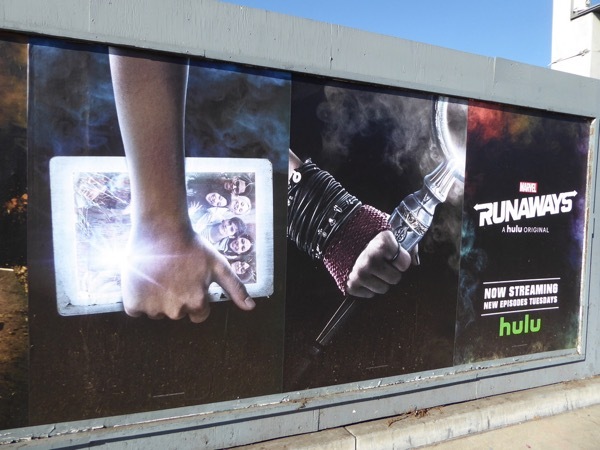 It'll be interesting to see what elements have survived from the comic books into televisual form, although it looks like dinosaurs, super-abilities, sorcery, fistigons and shadowy parental figures will all be present for our enjoyment. 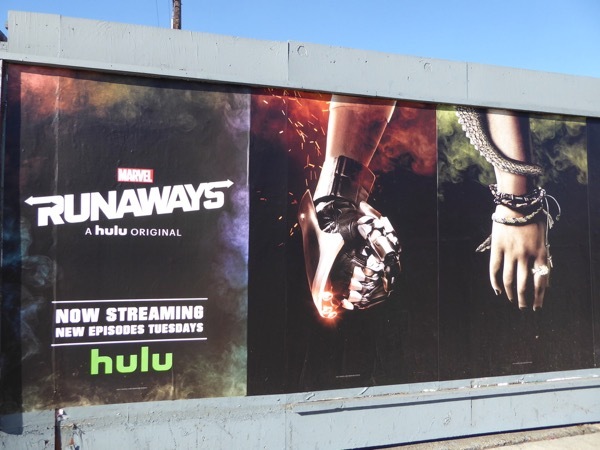 UPDATED: Here's also a collection of street posters for Marvel's Runaways highlighting each individual member's identity and hinting at their fantastical abilities. 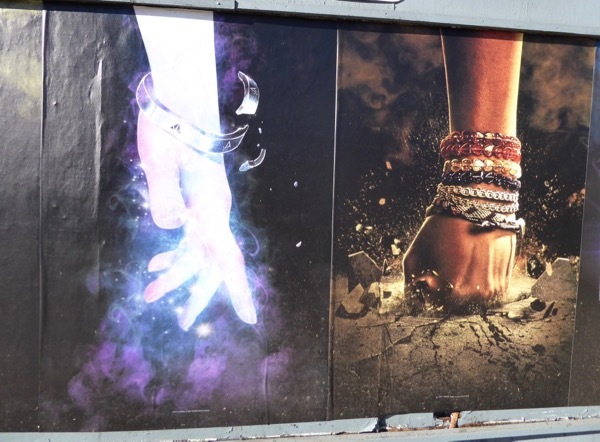 These character posters focusing on the kids hands were snapped along La Brea Avenue at Melrose Avenue on December 6, 2017. 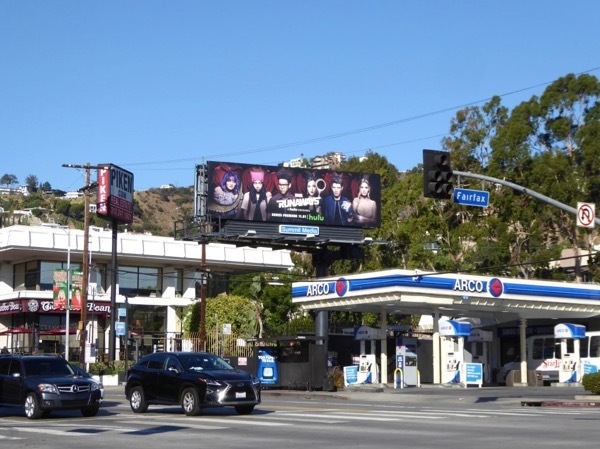 UPDATED: Here's another billboard for the fantastic series spotted high above Beverly Boulevard on January 5, 2017.